Let us help create exciting memories, have more fun, and truly experience your destination! Not valid for on stays over 28 days. 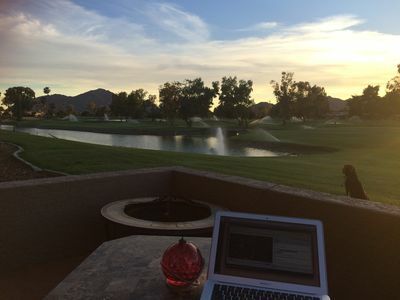 Peaceful Retreat! 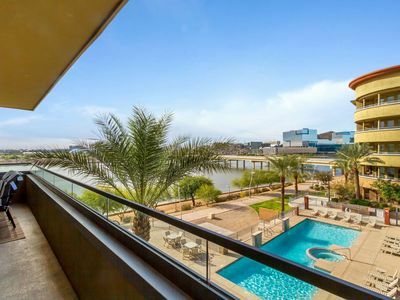 Located Right on Tempe Town Lake! 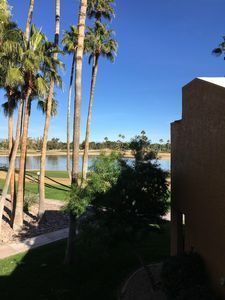 Not only is this a great location it’s a stunning condo that overlooks the North shore of Tempe Town Lake with breathtaking views and amenities! Walking distance to ASU, Starbucks, Wingstop, Pancheros Mexican Grill, In-N-Out Burger and Waba Grill. 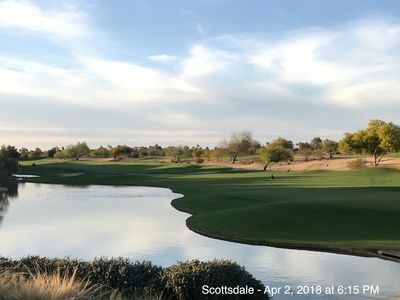 Minutes from Tempe Marketplace, Old Town Scottsdale, Arizona Mills Mall, Many Spring Training ball parks including Cubs, Angels, Giants, Diamond Backs etc and Sky Harbor Airport. 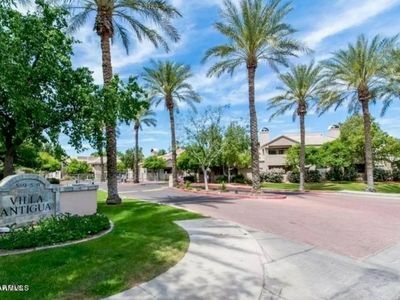 The Community has security, beautiful resort style heated pool and spa, courtyard, top of the line fitness room and a underground parking garage. Please read ahead to our 'House Rules' to understand the HOA rules and regulations per the rental agreement. 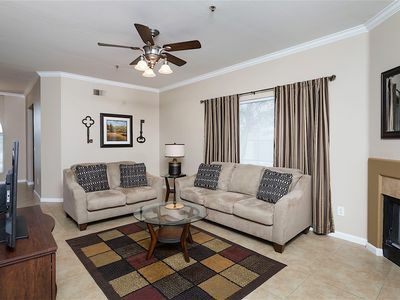 This condo is located on the 3rd floor and has elevator access directly to the condo. 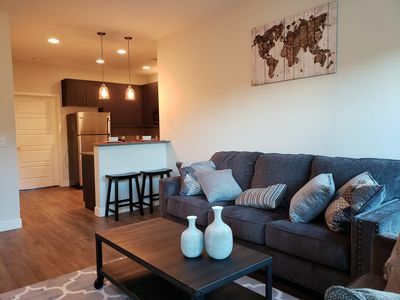 Walk in to an open kitchen, and living room floor plan with couch, chair and 55” flat screen TV for those nights you want to stay in cook and catch up on your favorite shows. There is a dining table with seating for 6. 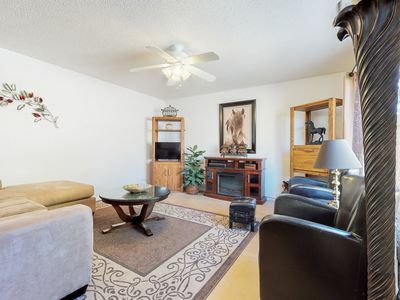 Enjoy your private balcony with outdoor dining, spectacular lake views and an outdoor fireplace! 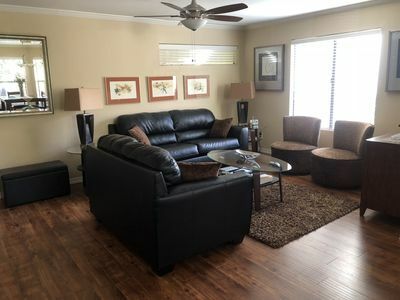 The master bedroom features a King size bed, 43” flat screen smart TV, arcadia door that takes you to the balcony and it’s very own private bathroom with garden tub, walk in shower and walk in closet. 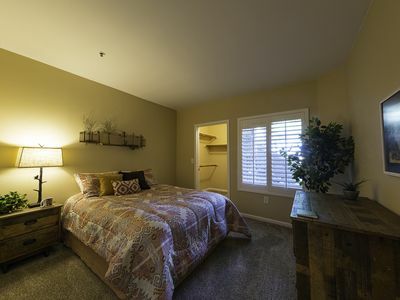 The guest bedroom has a Queen size bed and 43” flat screen smart TV and a door that takes you right out to the balcony. Guest bathroom has a single sink and tub/shower condo. There is a full size washer and dryer for your convenience. 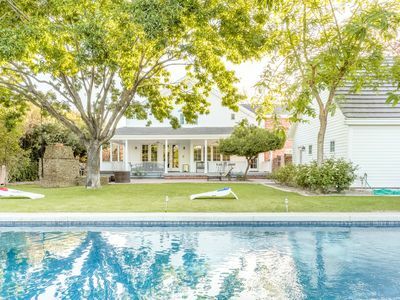 Spend your days relaxing by the pool and spa. The community has plenty of chase lounge chairs and two ramada's with gas BBQ grills and tables & chairs for outdoor dining. There's no reason you can't get in your daily workout in the fitness room which features state of the art fitness equipment. 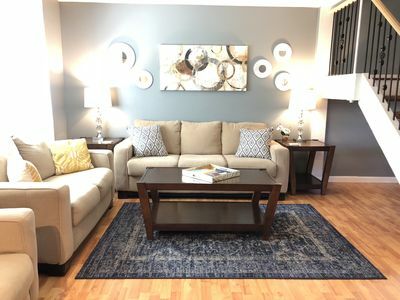 Come see all Tempe and this condo has to offer. It's absolutely spectacular. 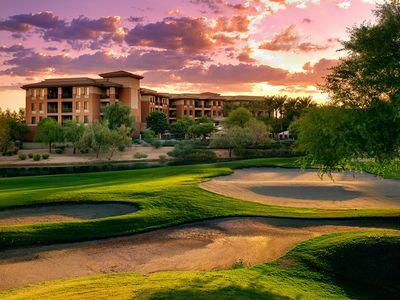 You won't regret making this your next getaway! 1. Pets: No Pets allowed! break this rule and we’ll have to charge you $500. 3. Trash: All trash MUST be securely tied and MUST "fit" in the trash chutes. Boxes (including pizza boxes) must be broken down and taken to the Trash Room adjacent to the elevator (north side) on the P1 level and placed in the dumpster. Trash placed in the hallway or common areas will not be collected and will result in fines and penalties. 4. Quiet Hours: Sunday - Thursday 10:00pm - 6:00am. Friday - Sunday 1:00am - 8:00am. Please be CONSIDERATE! Mind the neighbors, please! Parties or excessive noise is not allowed- misbehavior costs $500. 5. 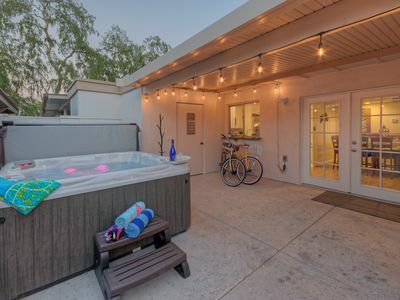 Pool, Hot Tub, and patios: Use of these areas are at your own risk. No lifeguard is provided. Pool Gates are locked during quiet hours. Climbing over the pool fence will result in a fine of $500 - $2500 for each offense. No Glass Containers are permitted in the pool/hot tub area. 6. Parking: Your assigned parking are designated. You MUST display the valid Parking Permit or your vehicle will be towed at your expense. 7. Bicycles: Bicycles Must be parked and secured in the designated areas in the garages. Do not ride bicycles in the hallways or courtyard areas. This will result in a fine. 8. No personal motorized devices (wheel chairs excepted) may be ridden in the hallways or courtyard areas. 9. Gates: Northshore is a gated community and access is strictly controlled. Make certain you close all gates and doors as you enter or exit. 10. When you make a reservation with us, you are agreeing to all of the above House Rules. **Free Fun! Guests will receive one complimentary admission per activity, per day. You can go to every activity, every day and one person will be free per day. Additional guests will pay full price. Admissions are noncumulative and nontransferable. Unused admissions expire daily. 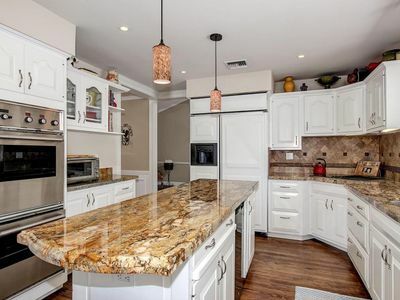 8 bdrm HUGE home, walk to Old Town Scottsdale! Maid service daily, luxury, WOW!! 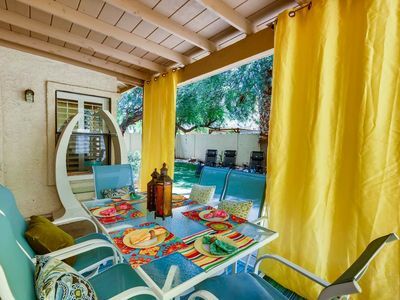 ☼ Scottsdale ★ 1 bed/King ✔ Super Location! 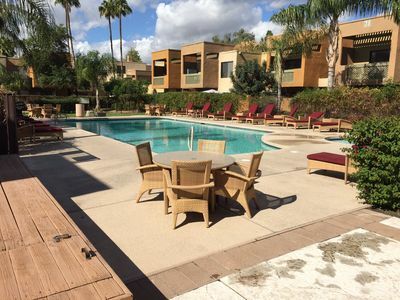 Comfortable condo w/ patio, shared pools/hot tub & quick access to freeways!